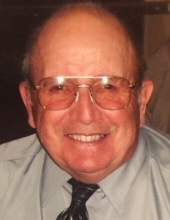 Donald Eugene Gilbertson, 87, of Black River Falls, WI passed away on April 6, 2019 at Marshfield Medical Center in Marshfield, WI. He was born on February 17, 1932 in Black River Falls, WI to Donald and Clara (Dill) Gilbertson. He married Janet Crawley on September 17, 1955. Don grew up on a dairy farm in Irving Township, Black River Falls, farming with his dad and brother, and later purchasing his own dairy farm near Melrose. Don was an extremely hard worker and in addition to farming, he built many of the buildings on the family farms, including two barns. With his herdsman skills, he built up a fine herd of all registered Holstein dairy cattle. Along with dairy cattle, he also raised feeder pigs for many years. Don farmed for many years and continued helping his son, Tony, on the farm until retiring in 2004. Don and Janet moved to Black River Falls in 1990 and enjoyed spending winters in Mesa, AZ. Through the years, Don enjoyed deer, turkey, elk, hunting and fishing. He was very talented making many wood working projects. He also liked putting puzzles together, framing them and often times giving away his projects to family and friends. Over the years, Don and Janet traveled throughout the United States. He loved playing cards; Euchre, Pinochle and 500 were a few of his favorites. He also loved to spend time with his family. Don was survived by his wife, Janet, of 63 years; sons, Terry and Tony; daughter, Tammie (James) Peterson; grandchildren: Alicia and Ryan Gilbertson and Jamie, Robbie, and Donnie Peterson; six great-grandchildren: Elijah, Logan, Parker, Emryn, Alizabeth, and Blake; and brother-in-law, Jim Crawley. Don was preceded in death by his parents, Don and Clara Gilbertson and brother, Eldon Gilbertson. Funeral services will be held 1:00 p.m., Tuesday, April 9, 2019 at Black River Falls United Methodist Church. Burial will follow at Riverside Cemetery in Black River Falls. Visitation will be from 12:00 noon until time of services at the church on Tuesday. To send flowers or a remembrance gift to the family of Donald Eugene Gilbertson, please visit our Tribute Store. "Email Address" would like to share the life celebration of Donald Eugene Gilbertson. Click on the "link" to go to share a favorite memory or leave a condolence message for the family.